East India House in Leadenhall Street in the City of London. The Company had occupied the site since the mid-17th century but expanded several times. This building was designed by Henry Holland. Work began in 1796 and included a museum housing the Company’s collection of exotic items. It was demolished in 1862 following the Company’s demise and is now the site of the Lloyd’s insurance building. The drawing is by T.H.Shepherd and was published in 1829. In the 18th century the world’s greatest commercial business was based in London, with its grand headquarters in Leadenhall Street in the City. During its two hundred and seventy year history the East India Company brought spices from the Far East that changed Britain’s cuisine, refashioned the nation’s use of fabrics from wool to cotton, then introduced tea as the favoured beverage. More significantly, it was in large part responsible for changing the world’s economy in favour of Britain but at great cost to the Indian sub-continent and China. Initially a trading company, its private army conquered a huge country, leading it to rule over a vast population. For centuries Asia was the world’s greatest manufacturing area, with spices and exotic luxury goods sent overland from there to Europe via Istanbul and on to Venice. Thus a camel was incorporated into the heraldic device of London’s medieval Grocers’ Company. Vasco de Gama was the first European to open a direct sea route with the Far East in 1499 and the Portuguese monopolised maritime routes with India and China for the next century. English merchants and privateers made exploratory trips to the Far East during the reign of Queen Elizabeth but little initially came of them other than gaining information that could be used on later voyages. The Dutch reached Bantam in Java from where they returned with spice, leading to the formation of the Verenigde Oostindische Compagnie (VOC) in 1602. It established a dominant position during the following century and for a time the VOC accounted for half the world’s shipping. When they first returned from Java laden with pepper in 1599 its price almost tripled in England, which made London merchants determined to create their own monopoly of the trade. A meeting was chaired by the Mayor at Founders’ Hall and an association was formed. On New Year’s Eve 1600 a royal charter was granted to the ‘Company and Merchants trading to the East Indies’, or ‘East India Company’, giving them a monopoly on English trade between the Cape of Good Hope and Magellan’s Strait. A small fleet of well-armed ships carrying around five hundred crew, many of them Thames watermen, sailed from Woolwich in 1601, backed by two hundred and eighteen subscribers. The Company was given the right to export silver – something that had previously been illegal – in order to purchase spices. A variety of goods, including metals, fabrics, lace and gifts for foreign officials, as well as bullion, were sent on the outbound voyage. Despite poor sailing conditions that made for slow progress and many of the crew succumbing to scurvy, they arrived at Achin on the Indonesian island of Sumatra in the spring of 1602. A trade agreement with the sultan was struck and a small settlement established as a base. Pepper, cloves, indigo, mace and silk were brought back providing substantial returns for the investors. Continuing voyages ensured that spices were thereafter widely available in Britain, changing the nation’s cuisine. A decade later a commercial treaty was concluded with the powerful Mughal emperor, who ruled much of the Indian sub-continent, giving the East India Company exclusive trading rights with the Surat region. Each of the early voyages were funded as individual ventures but in 1657 a permanent joint-stock corporation was formed, allowing the shares to be publicly traded. They could initially be purchased from the East India headquarters and later at the Royal Exchange. After a further two years, following a charter to the Company from Oliver Cromwell, an important supply base was established on the island of St.Helena in the South Atlantic, en-route between England and the Far East. An additional base was later available from when Cape Town became a British colony during the Napoleonic Wars. When they were expelled from the Spice Islands by the Dutch in 1682 the East India Company instead focussed its attention on India and its textiles. One of the Company’s trading stations was established at Bombay on the west coast of the Indian sub-continent. It had originally been founded by the Portuguese but transferred to Charles II in 1661 as part of the dowry of Catherine of Braganza and rented to the East India Company for ten pounds per year. (Oddly, the letters patent that sealed the agreement placed Bombay “in the Manor of East Greenwich in the County of Kent”). In the 1690s another base was established at the commercial centre of Calcutta on the prosperous Bengali coast of India and the area was soon providing over half the Company’s imports from Asia. By 1700 the East India Company was making twenty to thirty sailings per year to the Far East and was England’s largest corporation. The Indian subcontinent accounted for substantially more than twenty percent of the world’s gross domestic production, compared with less than two percent by Britain. The Bengal region in the north-east was the richest part of the Mughal empire. Its weavers had for centuries efficiently produced a vast range of the finest textiles in silk and cotton. These colourful products, such as muslin, calico, chintz, dungaree and gingham, became the East India’s primary imports into England. Business boomed and in the early 18th century East India-imported calico overtook native British wool as the most popular textile in English homes. This was to the great detriment of the local weaving industry, leading in 1697 to riots by London’s textile workers and assaults on the property of the Company and its directors, and two decades later attacks on London’s streets against women wearing calico. The government’s response was to restrict its importation and ban the use of powered looms in Bengal. 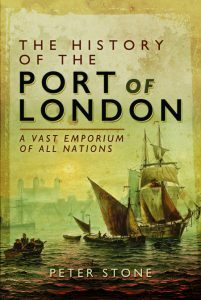 Between 1699 and 1774 the East India Company’s business increased to as much as fifteen percent of total annual imports into Britain, its taxes and other payments often keeping the British government solvent. From its headquarters in London instructions were sent around the world regarding what goods should be purchased and the price to be paid. Local Company governors in India were given autonomy as to how those purchases could be achieved. One of the Company’s strengths was its sophisticated fleet, its handsome and heavily-armed East Indiamen equal or superior to ships of the Royal Navy, with gilded sterns and flying the Company’s striped flag. Initially the Company purchased existing craft but from 1610 commissioned its own ships from a yard at Deptford, next to the Royal Dockyard. As business grew, vessels of up to one thousand tons were required, larger than could be constructed at Deptford, so the Company took the decision to create their own yard. A marshy area slightly downriver on the opposite bank was chosen, by the fishing hamlet of Blackwall where Bow Creek flows into the Thames. Work began to create the yard in May 1614. It was operational within a few months, although not completely developed until 1619, by which time it was employing up to four hundred workers. By then the Company operated a fleet of ten thousand tons, with two and a half thousand seamen. As with the royal dockyards on the opposite bank, the East India site at Blackwall was self-sufficient in all the needs of their ships, including the manufacture of its own ironwork and ropes. Employees were housed on site with their own victualing house where they could eat and drink. For security a large wall and water-filled ditch surrounded the premises. For customs inspections, imported goods were required to be discharged at the Legal Quays in the City until the opening of the East India Docks in the early 19th century. The ships would moor at Blackwall and their cargoes unloaded onto barges to be taken upriver for inspection. From there the goods were moved to the Company warehouses in the City. The Blackwall yard was a large fixed cost for the East India Company and when business became more difficult in the 1630s it proved to be a financial burden. After 1637 the Company ceased building its own ships and instead leased them from individual owners. The yard was sold in 1653 to a shipwright named Henry Johnson for considerably less than the Company had invested. Samuel Pepys’s recorded in his diary in January 1661: “…we took barge [from Greenwich] and went to blackwall and viewed the new dock and the new wett dock which is newly made there, and a brave new merchantman which is to be launched shortly, and they say to be called the Royall oake.” The yard came back into Company hands in the early 19th century as the East India Docks. The East India merchants initially met in the City at the home of the Company’s first Governor, Sir Thomas Smythe, in Philpot Lane, before setting up nearby at Crosby Hall at Bishopsgate until 1648. “The East India House is in Leadenhall-Street, an old, but spacious building; very convenient, though not beautiful” is how Daniel Defoe described the Company’s headquarters in the early 18th century, by then one of the landmarks of the City. In 1729 it was rebuilt to include warehouses and cellars and enlarged yet again at the end of the 18th century with a two hundred-metre neo-classical frontage decorated with statues. Its vast size included the Court Room hall, Finance and Home Committee Room, the Sale Room for auctions and museum and library. From East India House clerks known as ‘Writers’ wrote orders and other communications in longhand using quills and written in ‘Indian ink’, the replies to which would take a year to arrive back from the Far East. The imports brought back to England were stored in the Company’s warehouses in various locations in the City. To cope with expanding business in textiles, tea, spices, ivory and other goods a new Bengal warehouse was opened at Bishopsgate in 1771, which by the end of the century had become part of the massive Cutler Street complex. In 1756 the young and imprudent new Nawab of Bengal seized the East India base at Calcutta. The Company’s governor retreated, leaving a small number of British to defend their position, leading to the ‘Black Hole of Calcutta’ incident. The Company had from the start operated an armed security service to defend its ships and warehouses, which evolved into a private army. The following year this small but effective force defeated the Nawab’s much greater army at Plassey (Palashi), north of Calcutta. The victory was achieved in large part through bribery of the Nawab’s commanders, as well as deceit, undertaken by the Company’s Robert Clive. The East India competed against a number of other European traders in Bengal, including the VOC and the French Compagnie Francaise des Indies Orientales. The conditions on which the ‘kulah poshan’, or hat-wearers, could trade were imposed by the Indian rulers who ensured that business did not disrupt the fine balance of local commerce. Goods could only be purchased with silver bullion. The East India had ambitions to trade on its own terms however, without the hindrance of competition, and England was anyway at war with France. Having defeated the Nawab, the French and Dutch were largely expelled and Bengal systematically looted of its treasures, much of which were shipped back to England. A series of malleable puppet rulers was installed, each replaced according to the Company’s needs. To increase profits an internal and external monopoly was enforced, driving out competitors, directly buying from local manufacturers, and paying weavers the minimum possible for their labours. The Company also took control of local taxes, draining the province of its wealth. At the end of the 18th century up to ninety percent of Bengal’s trade was in the hands of the East India Company. Within a decade it had reversed the direction of wealth, from India to England. Profits flowed back to shareholders, as well as the British government by way of annual payments. From its base in London, trading goods halfway around the globe, from the Orient to the eastern seaboard of North America, the East India Company was rapidly transformed into the world’s greatest business entity but it did not have the internal structures to manage its distant staff or rule a large and highly-populated nation. Corruption was endemic. Clive and his fellow executives enriched themselves through private trading. Deprived of its social infrastructure, when Bengal suffered drought and famine in 1770 in excess of a million inhabitants perished while vast wealth continued to be transferred back to London. The following year Warren Hastings was appointed as Governor of Bengal and during his tenure a much greater part of India was brought under Company control. His eventual recall and trial in Westminster Hall “in the name of the people of India, whose laws, rights and liberties, he has subverted, whose properties he has destroyed, whose country he has laid waste and desolate” was the most talked about event in London of 1788. In the second half of the 18th century there was a dramatic increase in the size of the East India Company’s army in India and by 1806 it employed over one hundred and fifty thousand soldiers, with mainly British officers and native conscripts. A separate navy had been developed around the coast of India to combat piracy. During the French Revolutionary and Napoleonic wars three regiments of fifteen hundred Company workers were maintained for the defence of Company properties in the City of London. In 1809 a military seminary was opened near Croydon where cadets studied infantry, artillery engineering, surveying and languages. Under Governor-General Richard Wellesley, and the army commanded by his brother Arthur (the later Duke of Wellington), more territory in India was brought under the Company’s control. In the seventy years until the mid-19th century the area of the Indian sub-continent ruled by the Company rose from just seven percent to sixty-two percent, which also included Ceylon (Sri Lanka). By then the Company had for some years faced strong competition within its home market. Mechanisation in Lancashire’s cotton mills meant that by the end of the 18th century English-woven muslin was cheaper to produce than that imported from India. Whereas at the beginning of the Company’s rule India had been the world’s leading supplier of textiles, it became the largest importer of cotton goods from England due to lack of industrial progress. Opium, grown by the East India Company, was then its main export. India was the only source of diamonds until their discovery in Brazil in 1725 and those imported by the East India Company led to London becoming a leading trader in the precious stones. In 1849 the East India Company won control of the Punjab and its defeated Sikh rulers were forced to surrender the famous Koh-i-Noor diamond to become part of Queen Victoria’s Crown Jewels. A company trading post was established at Singapore in the early 19th century under the local governor, Stamford Raffles, as part of an Anglo-Dutch treaty. Raffles was especially interested in botany and zoology and became a founder of the London Zoological Society. Tea, grown exclusively in China, overtook textiles as the East India’s most profitable commodity by the mid-18th century, doubling in volume every eighteen years. The beverage was first brought to England by the Portuguese wife of Charles II. When mixed with slave-harvested sugar from the West Indies it transformed the drinking habits of people in Britain as an alternative to gin and was also popular in the colonies of North America. Especially large ships of one thousand two hundred tons carried it to London, where quarterly auctions lasted up to six days, with over a million pounds in weight sold per day. As they had in India, European merchants faced conditions under which they could trade in China. The Manchu emperor kept tight control and stipulated they must only make their purchases through local merchants at Canton on the Pearl River and pay in silver bullion. To evade the latter edict, the East India instead grew opium in India that could be used to pay for Chinese tea, silk and other exotic goods. Chinese styles caught the imagination of the British public, with porcelain and furniture made to order at workshops in Jingdezhan and Canton. In the early 17th century a return voyage to the Far East would take about two years but by the end of the 18th century that had been reduced to an average of one hundred and fourteen days. In the days of sail, East India ships left Blackwall each January in order to be in time for the winds required to carry them across the Indian Ocean. Convoys gathered in mid-stream at Gravesend where live animals and victuals were taken on board for the journey and passengers and outbound Company staff and soldiers embarked. It was not unknown for ships to perish at the very first or last stage of their journey, grounded on the sands around the Kent coast. The worst such incident occurred in January 1809 when three East Indiamen headed for Madras were lost on the Goodwin Sands. General ships’ crews tended to be recruited from amongst London’s poor but many died on the outward journey so locals were often employed for the return. These were known as ‘lascars’, a word first used by the Portuguese to describe any Asian crew. Arriving in London in the autumn they had to survive the cold, often without lodgings, until embarking on an outbound ship early the following year. By the end of the 18th century they were a common sight on London’s streets. After 1834 the East India no longer imported tea from China but continued to grow the opium in India that fed the trade. In the meantime they finally infiltrated the Chinese tea-producing areas to learn the secrets of its cultivation. Following the East India’s conquest of the Assam region of India, local varieties of the tea plant were discovered and Company plantations created there, the first harvest arriving in London in 1839. For a century the India the East India Company was an unusual organisation. Primarily a London-based trading company that worked for the benefit of its shareholders, it governed vast areas of the Indian sub-continent and employed a large military. In order to provide a degree of accountability and combat corruption within the Company the government passed the India Act in 1784. The charters that provided the East India Company with its monopolies on business with India and China were renewed by the British government every twenty years. By the time the India charter came up for renewal in 1813 there were many calling for the liberalisation of trade and the monopoly of two hundred years finally ended. Thereafter the Company continued to govern in India as an agent of Parliament. The China monopoly similarly ended in 1833. The East India docks were sold off and the City warehouses auctioned. East India House was demolished in 1862. In 1857 the Company’s Bengal Army mutinied, leading to a general uprising in India. The savage war lasted for two years, after which Parliament decided it was time for a change in the governance of the sub-continent. The East India was stripped of its administrative powers and replaced by the British Raj, managed from the magnificent new India Office in Whitehall. Queen Victoria became Empress of India and the Company’s forces became the British Indian Army. During its near two hundred and sixty year existence the Honourable East India Company – often called ‘John Company’ – went through four phases. First it brought spices directly from the Far East. In its second phase it revolutionised the fabric industry, bringing cheap, quality cottons and silks to Britain. Next it changed the drinking habits of the nation, with tea from China. Finally, it ceased to be a commercial operation but continued as the administrator of large parts of the Indian sub-continent. At its best it was highly-efficient and the world’s largest trading organisation, directly employing four thousand workers in London alone. Yet the large-scale corruption and its voracious appetite for excessive profits without accountability led to the plundering of the Indian economy and the near-enslavement of its people, and opium addiction of huge numbers of Chinese. To this day, Bengal, once one of the wealthiest regions of the world, remains ones of its poorest. Sources include: Nick Robins ‘The Corporation That Changed The World; Roger Williams ‘London’s Lost Global Giant’; Sir Joseph Broodbank ‘History of the Port of London’; Fiona Rule ‘London’s Docklands’; Ian Friel ‘Maritime History of Britain and Ireland’; Samuel Pepys diaries; Daniel Defoe ‘A Tour Through The Whole Island of Great Britain; John Keay ‘A History of India’.